I hope everyone is enjoying their summer, so far. I haven’t posted recently but ran into a situation that all agents should be aware of, especially those who work with FHA & VA Buyers. Now most FHA and VA purchase appraisals will result in a list of mandatory repairs that must be completed and signed-off on prior to the Buyer receiving FHA or VA financing. The repairs are typically the responsibility of the Seller to complete. The only problem, in my experience, is that the Sellers often don’t want to incur the expense of those repairs and will often cut corners in doing so. There was a situation like this last week where our office completed an FHA appraisal for a Buyer in Mount Airy. The appraisal was delivered to the lender along with a list of required repairs and pictures of those repair items. The lender sent the list of repairs to the Seller’s agent. However, the photos were not sent. What resulted was a lot of confusion and a postponement of settlement. In this case, the Seller did not fully understand what was being requested in the list of repairs. The Seller’s agent was not aware that the Seller was confused and was interpreting the list of repairs incorrectly. So, when the Seller read “Stain/Paint the exposed wood on the exterior of the rear deck” they just assumed that the repair meant the deck flooring. Had they seen the pictures in the report, they would have understood that the appraiser was calling the exposed wood in the entire deck to be stained/painted. This included the floor decking, the railings, the handrails and posts. Check out the photos below to see what was missed. When the appraiser went out to do the final inspection, he had to inform the lender that the repairs were not competed. The lender informed the Seller’s agent and the Seller who thought the repairs were done and that they were settling the next day. In fact, they now had to complete the additional repairs which delayed settlement for several days. The moral of the story is, as a Seller involved with FHA/VA Buyers, it is imperative that you have a full understanding of the repairs required by the appraiser. Be sure that you request any pictures of damage or repairs that the Seller might be responsible for completing. Lastly, if you have any questions or are unsure about what is being asked of you and your Seller, reach out to the Buyer’s lender and ask them to obtain clarification from the appraiser. Most appraisers are more than happy to help out. 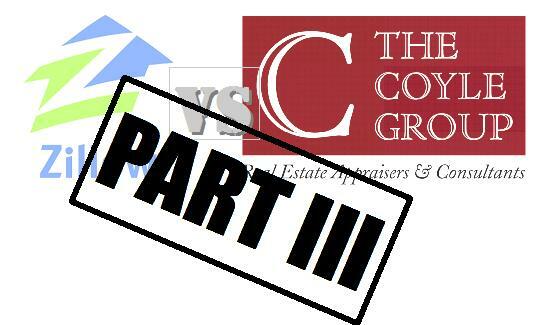 It’s that time again for the annual match up between Zillow and The Coyle Group. This year we randomly selected 25 appraisals completed by our office with in the past 3 months. The appraisals were of properties across Philadelphia, Montgomery County, Bucks County, Delaware County and Chester County. Housing styles ranged from simple South Philly row homes to Center City condos (you’re welcome Mark) to Main Line mansions. The results are pretty amazing. In a few comparisons, Zillow was right on target. For instance, I would say that they were spot-on with the Northeast Philly Row and the Queen Village Condo. They were fairly close with number of others including the Rittenhouse Square Townhouse, Society Hill Townhouse 1, the Bryn Mawr Colonial and Havertown Cape. However, Zillow completely whiffed on a number of others, most notably the Society Hill Townhouse 2. Zillow wasn’t even close. The Zestimate missed the mark by more than 127%. That’s crazy considering there was a recorded sale of this property in 2013 for $1.85M. This is where having a human being analyze the market data is so crucial. All the fancy algorithms and computer models overlooked the simple fact that this property sold only months ago for twice the Zestimate amount. We appraised the property a couple months after the sale and following a renovation of the kitchen and baths. On average, including the Society Hill 2 property, the Zillow Zestimate was 23.42% lower than the appraised value. Excluding the Society Hill 2 property, Zillow was still off by 16.47%. When Zillow over-Zestimated they did so by 11.25%, on average. These are some significant numbers. If you were selling and used a Zestimate to potentially under-price your house, you could be leaving huge sums of money on the table. If you overpriced, the market would likely pass you by in favor of more competitively priced homes. Eventually, you would have to reduce your price and by that time many of the interested buyers will have moved on. Philadelphia and the surrounding counties are such a patchwork of real estate markets that computers and algorithms can’t possibly take into account the individual nuances. Zillow doesn’t take into consideration if there’s a vacant house next to your property or a golf course. Zillow looks at them as being the same. That’s why having a knowledgeable appraiser to physically inspect the property is so important to realizing a correct value. Nothing (so far) beats having a live human being appraising your property. Bottom line, Zillow is not all bad. It is not an appraisal but it is a good place to start. The neighborhood data, general sales information, graphs and comparative tools are great and very user-friendly. However, if you are looking to properly price your home, I would pass Zillow by and get some advice from a good local agent or a certified appraiser. 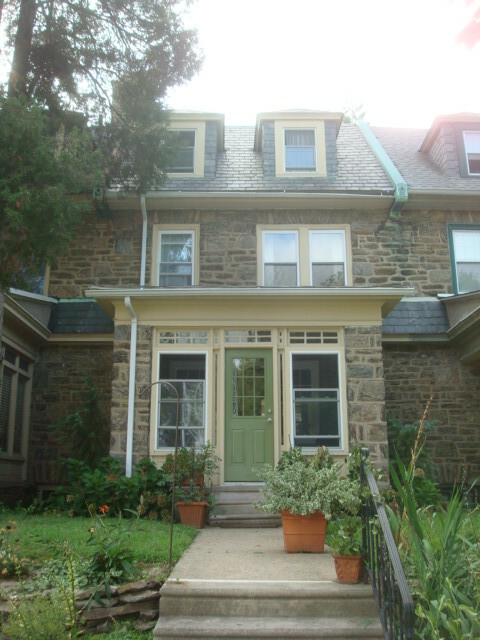 Being located in Erdenheim, just outside the city limits, we are frequently asked to appraise properties in northwestern Philadelphia, especially Chestnut Hill, Mount Airy, Roxborough and Manayunk. Below is a chart of the sales of 3-4 bedroom twins and rowhomes in Mt. 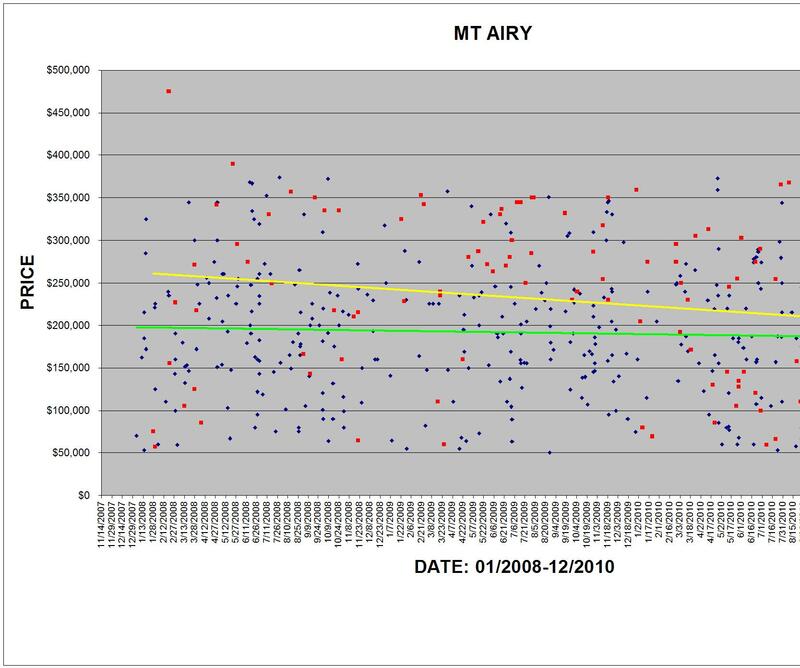 Airy from January 2008 through December 2010. Click on the chart to enlarge. The blue dots indicate the sales of 3 bedroom homes; the red dots represent the 4 bedroom sales. Our sample produced 341 sales of 3 bedrooms and 105 sales of 4 Bedroom homes, in Mt. Airy, during that time period. The green and yellow lines depict the linear sale price trends for 3 and 4 bedroom houses, respectively. The trend lines indicate that both 3 and 4 bedroom homes are moving downward. However, it appears as though the 4 bedroom properties are experiencing a deeper shift that the 3 bedrooms, which are riding a flatter trend. This is likely due to the fact that there are fewer 4 bedrooms homes and, as a result, fewer 4 bedroom sales. With a smaller sample, it is easier for a few sales to influence the trend. Conversely, with a greater number of samples it is less likely that a handful of sales to move the trend so dramatically. If you have a question about real estate markets and trends in the Philadelphia region, please visit our Ask PAB! page to submit your inquiry.